If you are involved with a university, this message is for you: transportation department officials, university police officers, campus sustainability groups, or even concerned campus cyclists. We are Bike Index and we're ready to build a registration system to chronicle and protect your bicycles. Bike Index has built bicycle registries for three universities to date: the University of Maryland, College Park, the University of Washington in Seattle, and the University of Pittsburgh in, well, Pittsburgh. We have additional universities in the pipeline right now, and our reach is steadily growing with a network of connected transportation and police department officials who can work together to utilize and implement Bike Index in the best possible way for each of their universities all around the country. As we continually expand into more universities, we're realizing that the university is 1000 percent the perfect place for a Bike Index system. It's a microcosm for the way any community would use Bike Index: officials across department lines can connect to register bikes for students and campus members, and when a bike is stolen and taken away from campus, these officials have the ability to get in touch with, and appeal to, local law enforcement, bike shops, and advocacy groups to keep eyes out for stolen campus bicycles. Universities can use Bike Index to manage registries for their surrounding areas in one huge system yet still give other local groups autonomy in their own registration processes. "I think Bike Index is awesome. It's outstanding to have a nonprofit with a strong connection to the bike advocacy world registering bikes on campuses," says Ted Sweeney, who was the Active Transportation Specialist at UW for four years, including the time at which the university switched to Bike Index as their bicycle registration system. Though he has moved on from UW, Sweeney remains a big Bike Index fan. Sweeney is particularly an advocate because we helped to recover his road bike when we tweeted it out (like we do with all stolen bikes through our regional accounts) and someone got in touch with information on the bike. Bike Index works! "I don't think I would have recovered my road bike if it weren't for Bike Index. They really get the job done. Bike Index is able to create simple, affordable, and intuitive options for students during the very hectic orientation process when transport departments have only a few moments with students to get the serial number captured," says Sweeney. We take time to develop new features with universities who want to see Bike Index features that don't yet exist. Yes, you heard that right. We will build pretty much whatever you want. We are committed to making the most-functional university bicycle registration system out there, and that means making sure it has all of the features a university would need. We are highly custom, and we will put together whatever package of materials will be most effective for your university. We don't do any sort of bundling that forces you to integrate and pay for something that will not be useful for your university, and that will up your charges. We just want to give you what you will use, and then help you use it. We're inexpensive. We also have, and always have had, a completely free version of our site for departments that don't have a budget for a bicycle specific registry. But for those who do have a budget, we don't charge you tens of thousands of dollars. We're a nonprofit, so our goal isn't to squeeze universities for every last penny, especially with looming funding cuts everywhere all the time. We want to build what you need and charge what it costs for us to build, nothing more. We're personal and responsive. We respond to troubleshooting questions within two days, not in two weeks. We plan phone calls, and we work on building a registry hand-in-hand with our university partners, not just giving you something standard and sterile. Bike Index is bicycle specific. We're not transportation general. We know how to manage bicycles, bicycle thefts, and the nuances of a bicycle-specific registration system, because it's literally all we do. We provide bike-specific features and aid in stolen bicycle recoveries. 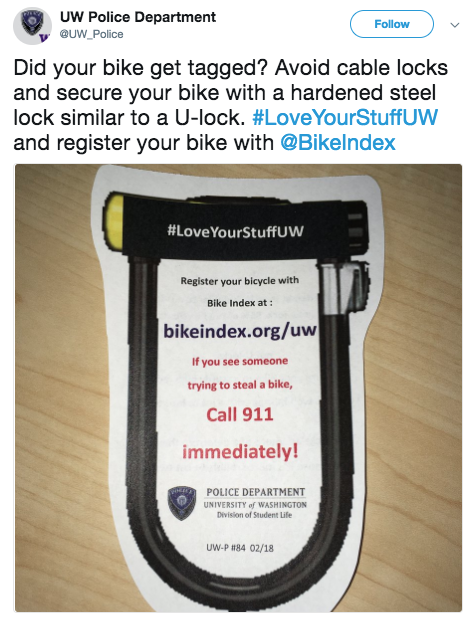 Bike theft is an inherent problem on college campuses that many a parking system has not programmed for. We also have features for abandoned bikes and bikes that have been locked where they shouldn't be - solutions specific to university bike issues. We don't add time to your registration and recovery process, we diminish this time. Less work for you! Isn't that awesome? We'll build your system, teach you how to use it, then let you go free (but we'll always be here to answer your questions and work on new things with you when you want them). We'll give you resources to get in touch with bike owners, and diminish the amount of space you have to devote to stashing abandoned bikes or those not linked to an owner. We offer all of our valuable partnerships with organizations that will help you canvas your cities for bikes stolen from campus. 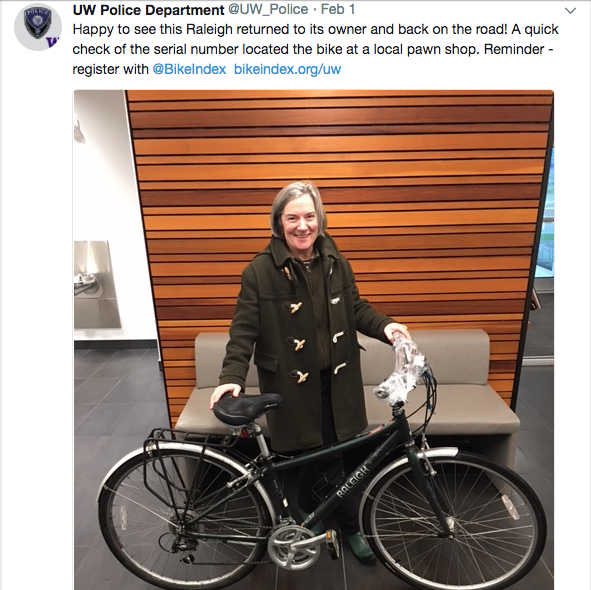 Through partnerships with local groups and national partners like LeadsOnline, universities will be able to find bikes that are no longer under their campus jurisdiction. With an independently-run registration system, universities forgo meaningful connections with cycling organizations in their communities, often the connections that can lead to theft recoveries. Bike Index provides these connections. Sweeney also notes the benefit of Bike Index for students: "In just a few moments and without downloading any apps, students can come away with the peace of mind that if something happens to their bike, their information will go in front of the greatest number of eyes possible." Seeing as the students and other campus members are the ones populating Bike Index with registrations, it only makes sense that Bike Index encourages registrations through ease and free-ness. "Among other options, Bike Index really stands out for their commitment to creating tailored, accessible solutions, and their nonprofit, advocacy ethos," said Sweeney. Now is the best and most perfect time to get in touch with us about establishing a Bike Index registration system at your university. If we can get working with you before the summer bike season rush, that puts us way ahead of time for finishing a registration system before school starts up again in the fall. Getting in touch with us in the summertime - or anytime really - is cool too, but if you can get into the system now, then you won't be backlogged when everyone gets in touch with us in June or July. If you are a member of a university community - in any capacity - please get in touch with lily@bikeindex.org and we can begin a conversation on implementing Bike Index for your university.